Recommended length is 50, 75, or 100 ft (15, 23, or 31 m). Dataloggers other than the CR3000 and CR5000 require the 4WPB100 to measure the NR01's temperature sensor. The 4WPB100 provides completion resistors for measuring 100-ohm Platinum Resistive Thermometers (PRT). The CM203 is a 3 ft crossarm that attaches to an instrument tower or tripod. It provides a rugged, weather-resistant sensor mount for one sensor (typically). The CM203 is compatible with our tripods and towers. It can also be attached to a user-supplied pole. The CM204 is a crossarm that attaches to an instrument tower or tripod. It provides a rugged, weather-resistant sensor mount for one or two sensors. The CM204 is compatible with our tripods and towers. It can also be attached to user-supplied pole. The 21271 is used to attach an older NR01 net radiometer (serial numbers less than 2313) to a CM204 or CM206 crossarm. 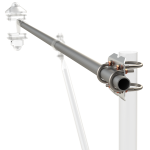 Campbell Scientific recommends mounting the crossarm to a CM300-series mounting pole at least 25 ft away from other mounting structures.